Sunday's Chinese Grand Prix is live on 5 live and the BBC Sport website at 07:10 BSTSebastian Vettel snatched a last-gasp Chinese Grand Prix pole position from Ferrari team-mate Kimi Raikkonen as Lewis Hamilton struggled.Raikkonen was the quicker Ferrari going into the final runs but a scrappy final sector and a superb one from Vettel gave the German pole by 0.087 seconds.Mercedes lacked performance - Hamilton was 0.58secs off pole and fourth behind team-mate Valtteri Bottas. 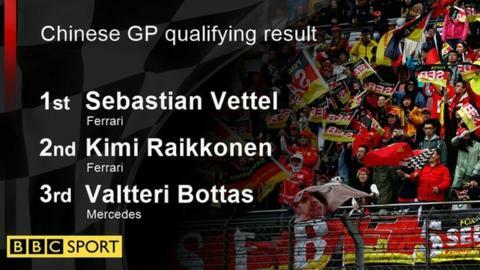 Hamilton now must prevent losing more ground to Vettel in the championship. Raikkonen had looked set for his first pole position since Monaco last year.The Finn was 0.161secs ahead of Vettel on the first runs in the final session of qualifying and set fastest sector times in both the first two parts of the lap.But he failed to improve on in the last few corners, and that gave Vettel the opportunity to steal pole and put himself in a strong position for a third consecutive race win that would give him a stranglehold on the championship battle.